The automotive repair industry is worth an estimated $70 billion per year in the United States alone, making it a gigantic industry. What’s more, this industry is highly dispersed, with the top 50 chains only accounting for around 10 percent of the industry’s total revenues. This makes the automotive repair industry one of the few still remaining where dedicated entrepreneurs can really have a shot at making it big. But that is not to say that the industry isn’t highly competitive. In fact, the fractured nature of the automotive repair business makes it one of the most competitive fields around. This means that shop owners need every edge that they can get. And one of the best ways to achieve that edge is through the use of digital vehicle inspection software. Digital vehicle inspection software can help streamline and automate every step of the automotive repair process, from initial diagnostics to customer checkout. Tekmetric takes digital vehicle inspection to the next level, helping shop owners to eliminate inefficiencies in literally every aspect of their operations. One of the areas where Tekmetric contributes in the most readily visible way is in the realm of digital vehicle inspection itself. Modern cars and trucks are essentially self-propelled computer systems. The pace of change has been staggering, leaving many legacy mechanics and shops struggling to keep up with the breakneck pace of advancing technology. Tekmetric can help mechanics and other shop employees to use their hard-one mechanical skills in the context of the often-mind-boggling complexity of modern vehicles. Tekmetric can help in the initial diagnostics process, helping to pinpoint faults in the vehicle’s system much faster than would be possible without aid or with older digital vehicle inspection systems. Tekmetric has been designed using state-of-the-art artificial intelligence that uses trillions of data points, allowing complex diagnostic procedures to go from hours to just seconds. 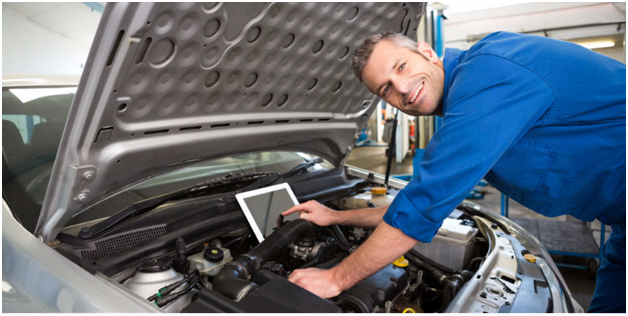 Tekmetric digital vehicle inspection software also helps to put the right people on the job. With its advanced shop analytics suite, it gives shop owners the ability to visualize every aspect of their operations using graphics that are intuitive and easy to read. This functionality can be used to make sure that the best people are on the jobs that most closely match their respective skillsets, helping to keep production times down to a minimum. The system is also able to help shop owners carefully determine the optimal pricing structure for the given micro- and macro-economic conditions that prevail. Because automotive repair is almost always a quote-based enterprise, foregoing fixed pricing in favor of per-job quotes, Tekmetric can help maximize the advantages of this business model, right down to giving owners the ability to change the estimated price of labor and parts as a function of the day or time of year. The first generation of onboard diagnostics revealed an entirely new paradigm for maintaining and repairing vehicles. But this first-generation system had some major limitations. It wasn’t until the introduction of OBD II that the full power of onboard diagnostics became really apparent to all. Still, OBD II was mostly a simple data-displaying technology that lacked sophisticated built-in analytics. Tekmetric takes the OBD II platform and expands it into one of the most powerful automotive tools ever devised. With its trillions of training data points, all generated in the real world, Tekmetric’s powerful analytics can take hundreds of variables into account, forming a diagnostic hypothesis that is based on statistically rigorous modeling and delivers accuracy that has never before been seen. With Tekmetric, running an automotive shop becomes a scientific pursuit plan.